•	Get data from a two data sources, SQL database, and Excel file. •	Merge the data coming from source using Merge Join. •	Generate flat file as output. •	In case of Success or failure notify through Email. Double click on data flow task, add two or more Source database like SQL server database, Excel file and configure the source database. Here, we are using SQL database. Hence, we will add OLE DB source from SSIS toolbox. To configure the OLE DB source, double click on the Source and you will see window as shown in image below. Now configure Excel source as shown in image below. In order to merge the data between two or more source, the data needs to be sorted. Hence, we will have to use SORT function before using Merge join function. 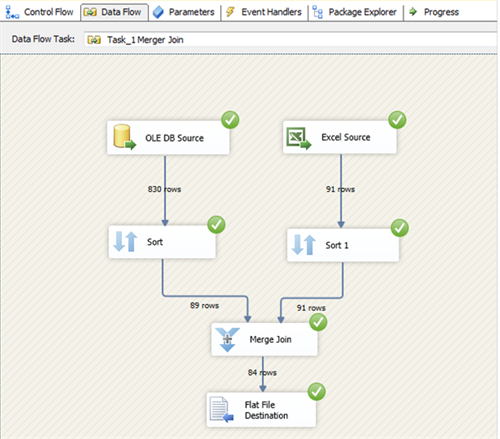 Drag and drop SORT from SSIS toolbox in design surface. While sorting the data, we have to give column names which are having same metadata in both the sources. Hence, metadata of both the columns should be same. If so then we can configure Merge Join Transformation. Select Join type as per the requirement which is highlighted in above image and select required columns. •	Inner Join: It returns matched data between two tables as per the condition given as input in Merge Join. •	Full Outer Join: FULL OUTER JOIN returns all rows from the left table and from the right table given as Input in Merge Join. Finally you will have a similar structure like image below. 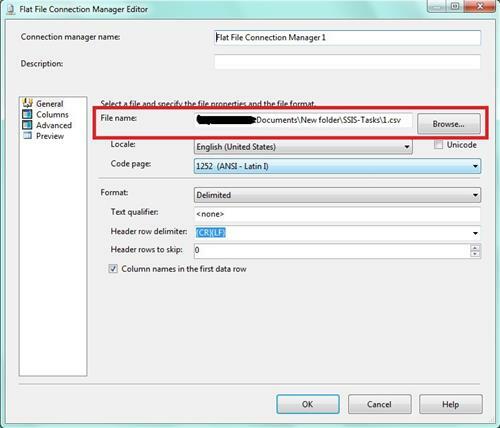 This is how we can merge the data from two or more data sources and generate output file as per requirement in SSIS. •	To merge the data from different sources, we need to SORT the data. 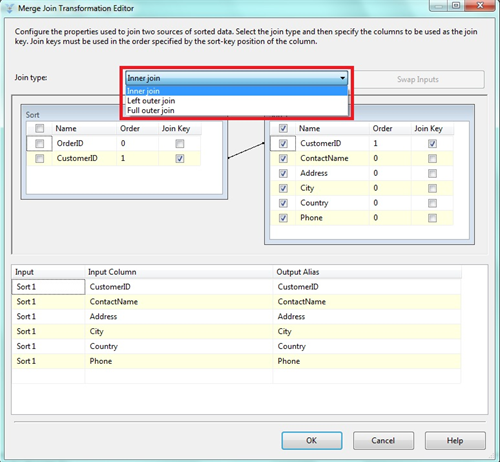 •	While merging the data using MERGE JOIN, the columns must have same metadata. •	Give proper connection paths while configuring Source and Destinations.